These peanut butter fudge bunnies from Hungry Happenings are an easy Easter treat. This Easter candy was inspired by the peanut butter filled chocolate eggs that are available during the holiday. The bunnies are made with a couple of ingredients found in your local supermarket (excluding the white confectionery coating and molding chocolate which are found where cake decorating and candy making supplies are sold). Beth, the candy maker, suggests that if you cannot find Reese's peanut butter chips, you can use her recipe for peanut butter fudge as a substitute. 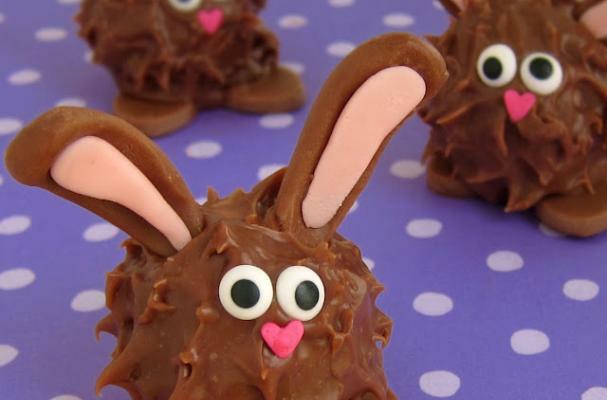 Fill you children's Easter baskets with these homemade peanut butter fudge bunnies.